This proposal for CETA Ltd was a bold attempt to take Edinburgh onto the world stage in ecological technologies. The Solar Station would re-configure the roof of Waverley Station to become the largest photovoltaic installation in the world covering some 20,000 m2. Electricity generated would be used to provide sustainable transport in the City. The proposal shows panels fixed to a novel reciprocal frame structure which interpenetrates dynamically with the station concourse. This project was carried out in collaboration with artist Barbara Beyer. 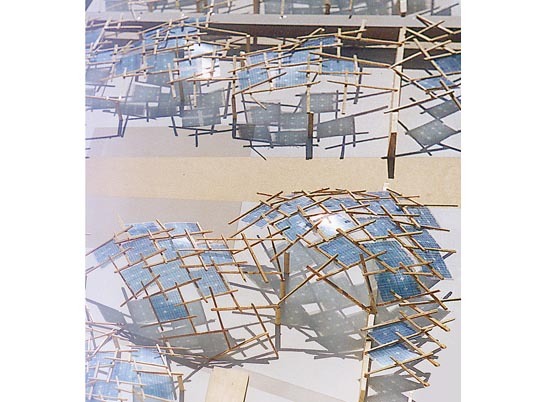 The proposals were Short Listed in the Pan European PV Design Competition judged at the16th annual European PV Solar Energy Conference held in May 2000. Article in magazine "Sculpture Matters"